Missing, mal-formed, discolored, stained and decayed natural teeth ruin your smile makeover adversely affecting your confidence, self-esteem and appeal during important presentations at your office or verbal examination in the university if you are a student. Mild stains and discolorations of teeth can be removed with scaling, polishing and teeth whitening procedures. Teeth whitening resistant discolorations pose real threat and require invasive cosmetic dentistry treatments such as porcelain veneers, ceramic crowns and dental bridges for restoring smiles. These procedures necessitate removal of sound natural tooth portions with resultant sensitivity, pain and discomfort associated with drilling and cutting of living tooth structure. Get in touch with your Cosmetic Dentist Albuquerque. Albuquerque New Mexico 24 hours emergency specialist cosmetic & restorative dentist Dr William C Gardner at NM Family and Cosmetic Dentistry PC offers the most conservative cosmetic enhancement of your esthetically compromised teeth in the form of latest dental lamination technology employing resin composites known as COMPONEERS. Q. WHAT ARE DENTAL COMPONEERS? A. Dental COMPONEERS are basically pre-fabricated composite resin veneers which provide high strength, beautiful looking, conservative and extremely cost-effective solution for the achievement of perfect smile makeover as compared to porcelain dental veneers. Because dental veneers are highly popular, do not miss out. Q. WHEN SHOULD I OPT FOR DENTAL COMPONEERS? A. Dental COMPONEERS can be used for the treatment of your traumatized, chipped off, broken, decayed, mal-formed, yellowish, slightly mal-aligned, internally stained and discolored teeth. Your Cosmetic Dentist Albuquerque can be of great help. Q. HOW DENTAL COMPONEERS ARE DIFFERENT FROM CONVENTIONAL VENEERS? A. Dental COMPONEERS provide an excellent conservative alternative to conventional porcelain veneers. Traditional veneers or laminations require removal of as much as 0.5mm of healthy natural tooth tissues for creating space for the prosthesis. In addition to destructive tooth cutting, number of visits and time of treatment is also increased. 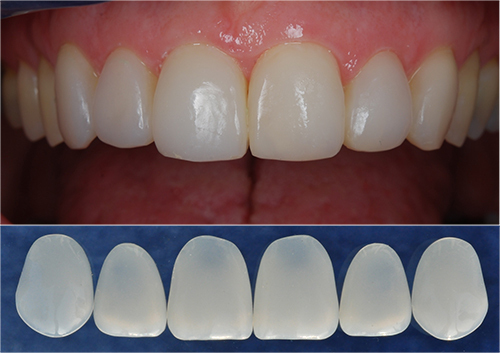 COMPONEERS offer the same advantages of dental laboratory fabricated porcelain veneers with ultrathin structure and exact color matching characteristics. Q. CAN I GET ONLY COSMETIC BENEFIT FROM DENTAL COMPONEERS? A. No doubt dental COMPONEERS are considered as an excellent solution for cosmetic defects and abnormalities of teeth. However, resiliency, toughness and strength of these composite veneers offer restorative longevity and merits as well. Q. CAN THESE COMPONEERS EASILY REPAIRED IF DAMAGED? A. Yes, because COMPONEERS can be easily repaired with dental composite resin material. Q. WILL I FEEL PAIN AND DISCOMFORT DURING PLACEMENT OF DENTAL COMPONEERS? A. COMPONEERS are highly conservative and minimally invasive cosmetic restorations for your teeth. These restorations require almost no or minimal removal of natural tooth tissues. There is no sensitivity or pain. For anxious and fearful patients, conscious sedation helps in creating soothing and comfortable environment. Q. HOW LONG WILL MY COMPONEERS LAST? A. COMPONEERS are durable and long lasting dental cosmetic restorations. These are popular for approximately 8-10 years. There may be need for repair of the prosthesis depending upon the degree of care and maintenance. Call for an appointment with Cosmetic Dentist Albuquerque because we are the best here. Q. WHAT ARE THE ADVANTAGES OF COMPONEERS? Do you have cosmetic defects in your teeth? Is it making your smile less pleasant? Is this owing to decayed, missing, crowded, crooked, mal-aligned or mal-posed teeth? You can visit your 24 hours emergency Albuquerque New Mexico dentist Dr William C Gardner. Book an appointment at NM Family and Cosmetic Dentistry PC. He is available throughout day and night. He focuses upon best solution for improving your dental and oral health conditions. Call now for Cosmetic Dentist Albuquerque.